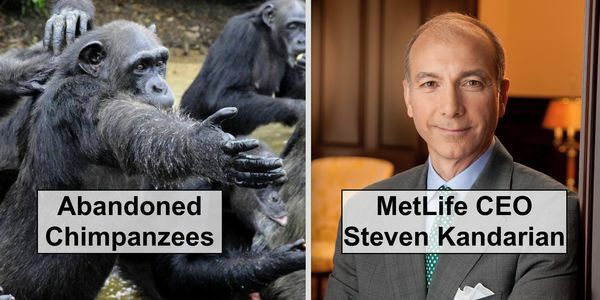 As the New York Blood Center's (NYBC) largest corporate donor, MetLife has the power to compel the organization to reinstate funding for the 67 chimpanzees who they abandoned with no food or water. For a 30 year period starting in the mid-1970s, NYBC conducted experiments on over 400 hundred chimpanzees in Liberia, where they could capture, breed and experiment on them with little regulatory oversight. When the research was complete, NYBC moved the survivors onto six islands in Liberia and one island in The Ivory Coast and made a public commitment to provide them with lifelong care. In May, 2015, the New York Times reported that NYBC had “withdrawn all funding for them,” leaving the chimps to die of starvation and thirst. Since then, an HSUS-led coalition of over 30 animal conservation groups has raised funds from the public to pay for the chimps’ care on an emergency basis. Please sign this petition to ask MetLife, NYBC’s largest and most prominent corporate donor, to exert its influence over NYBC by demanding that the organization provides the funding to pay for the care of the chimps. Since July, 2015, advocates worldwide have contacted MetLife through emails, social media and other petitions to ask the company to be a voice for the 67 chimpanzees abandoned in Liberia and The Ivory Coast by the New York Blood Center (NYBC), an organization to which MetLife gives hundreds of thousands of dollars annually (if not more) and to which you provide retail space in your global headquarters. The community is not asking MetLife to rescue the abandoned chimps. Nor are we asking you to contribute financially to the victims’ care, as Citigroup has done. We are merely asking MetLife, NYBC’s largest and most prominent corporate donor, to exert your influence over NYBC on behalf of the 64 survivors for whom the organization promised to provide lifelong care. NYBC created the captive chimp populations and is attempting to extricate itself from its ethical obligation to pay for their care by shifting the burden to animal welfare organizations. NYBC has earned an estimated $500 million in royalties off of their chimpanzee research and, unlike animal welfare organizations that did not create this crisis, has the resources to provide the survivors with food and water. In mid-April a great ape rescue group visited Ponso, the sole survivor of a colony of 20 chimps abandoned by NYBC on an island in The Ivory Coast. Ponso’s female companion and their two children died in a two day period in 2013, leaving him all alone. Germain, a local farmer (pictured below) who brings him food, said that he watched Ponso bury his family by tossing dirt over their graves. Ponso has watched his entire colony of chimpanzees die of sickness and starvation. Now, this intelligent, social animal is alone and struggling to survive — mentally and physically. NYBC researchers acquired Ponso when he was a baby and stripped him of his freedom, health and safety. And, when they no longer needed his body, they left him to die. Please do not continue to turn a blind eye to the New York Blood Center's recklessness and abject cruelty. Take action now for the surviving victims.